Samui Ferry operates from Bangkok, Phuket, Krabi, Surat Thani and more! For all Samui Ferry routes and for the latest prices and sailing times see below. 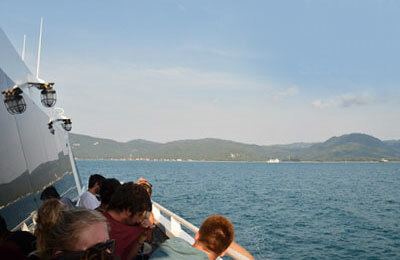 Click on your ferry route for a detailed Samui Ferry timetable. You will need to print out your booking confirmation. Please check the pier information beforehand to know exactly where to go. The operator recommends to check-in at least 30 minutes before departure. When you arrive at the pier present your printed booking confirmation to the staff of the boat. They will give you a sticker or a boarding card and direct you to your boat. In most ports the staff will be close to the boat. In Samui, the staff will be sitting at booths in front of the boat loading area. Most docks have staff that will help you to embark your luggage. How long before departure should I arrive for Samui Ferry?